Jonathan Clemence Peter died in Cape Town on the 2nd of April 2018 after an illness confronted with courage and dignity. A beloved father, husband, neurosurgeon, leader, teacher, mentor and friend, he leaves a legacy characterised by deep respect and affection within the neurosurgical community. Born in East London in 1942, the second child of Elizabeth and Clemence Peter, Jonathan's family relocated to Natal following the tragic death of his father, an alumnus of the University of Cape Town, while serving as an army medic in Tobruk, North Africa. He enjoyed a distinguished school career at Maritzburg College where he matriculated in 1958 and decided, despite showing great promise as a musician, to follow his father's career and study medicine at UCT. His future career, as so often in clinical medicine, was shaped by a tragic life encounter as an undergraduate. A young man suffered severe brain injury from an extradural haematoma because there was no neurosurgeon to treat him. He was appalled at the devastating consequences of such a treatable condition and, determined to make a difference, embarked on a career in neurosurgery. Following internship at Groote Schuur Hospital in 1965, in the legendary Brock and Louw Firms, he spent a year in Neurology with Jim McGregor and Frances Ames. He then proceeded to the Banting-Best Institute in Toronto as a Scott-Playfair Neurosurgical Research Fellow. He spent time with Ron Tasker, doyen of stereotactic neurosurgery, and later with Paul Yakovlev at Harvard. Despite being inspired by the founding generation of paediatric neurosurgeons, in USA, he turned down surgical training at the prestigious Gallie Surgical Unit in Toronto, and decided to return to South Africa. 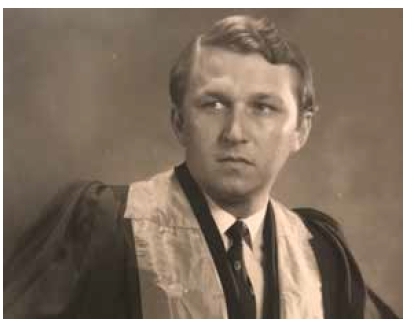 After a short stint in Durban, and admission as a Fellow of the Royal College of Surgeons in 1971, Jonathan commenced neurosurgical training under the guidance of Professor JC "Kay" de Villiers at Groote Schuur Hospital where he formed lifelong friendships with his fellow trainees, Paul Cluver, Roger Melvill, Freddie Kieck and Warwick Peacock. In 1976 his other passion led to a musical interlude of 10 years culminating in the award of a Bachelor of Music degree in 1985. At that stage he decided it was time to return to being a neurosurgical registrar. This second chance was granted and his incredible enthusiasm for work led to him, in 1987, taking charge of the paediatric neurosurgery service established at Red Cross War Memorial Children's Hospital by his friend Warwick Peacock in 1979. Paediatric neurosurgery defined the rest of his career. He made important scientific contributions to the treatment of congenital disorders, spasticity, hydrocephalus and brain injury, and made many friends around the world through the International Society for Paediatric Neurosurgery (ISPN). The society recognised his contribution when he was elected as their 29th President at Kyoto Congress, Japan in 2002. He inspired a generation of paediatric neurosurgeons in Africa, including myself, Tony Figaji, Llewellyn Padayachy and Nico Enslin in South Africa, John Mugamba, Peter Ssenyonga and Emmanuel Wegoye from Uganda and Kachinga Sichizya from Zambia. During his tenure as the second incumbent of the Helen and Morris Mauerberger Chair of Neurosurgery he built a much-admired department encouraging the growth of sub-specialties, enabling many of his trainees to achieve international reputations in their fields. Nationally he made major contributions whilst, serving as president of the College of Neurosurgeons, the Society of Neurosurgeons of SA and representing Africa as second Vice President in the World Federation. He fostered relationships between Neurosurgery and Neurology which in no small measure paved the way for the Neuroscience Institute currently under construction at Groote Schuur Hospital. 2007 brought "retirement" in which Jonathan continued innovating with Tony Figaji and Francesco Sala to establish a world-class intraoperative neurophysiology service, mentoring his colleagues and, with his passion, teaching which he continued until January of this year. He had special talents in the operating theatre where he imparted skills with such calmness and imparted judgement, when to start, when not to start, and when to stop. With an astonishing breadth of talents and a deep interest in humanity and all forms of professional and cultural expression no one person could ever give a complete account of a life so richly textured as his. There were so many lessons to be learned from Jonathan, his incredible sense of fairness, always showing such care and concern his patients and colleagues, and reminding us that this enthusiasm was born of having had a second chance. UCT runs very deep in Jonathan's family. His children Larissa and Jonny, and their spouses Eugenio and Jo, are all alumni of UCT medical school, while grandchildren Angelica and Monica ensure that there is now a fourth generation of this remarkable family in our faculty. We extend to all of them, and to Agnes and Elizabeth our deepest sympathy at the loss.